Macleay College’s Melbourne advertising students visited the ADMA DATA DAY to pick up some insider tips on the perils of social media marketing and why you should never ignore sleeping casino visitors. Advertising student Gianni Piccolo reports. There’s a bearded man wearing a suit and round glasses, sleeping in a chair with hundreds of people scuttling past him on their way to gather lunch from the buffet at Melbourne’s Crown Casino. I’m getting worried as I see him lying there, wondering of I’m going to regret the decision to go to an event I didn’t know much about on the first day of holidays? Our lecturer from Macleay College got us tickets to the ADMA DATA DAY at the Crown Palladium. The day was jam-packed full of talks on data strategy, content, technology, analytics and data activation. 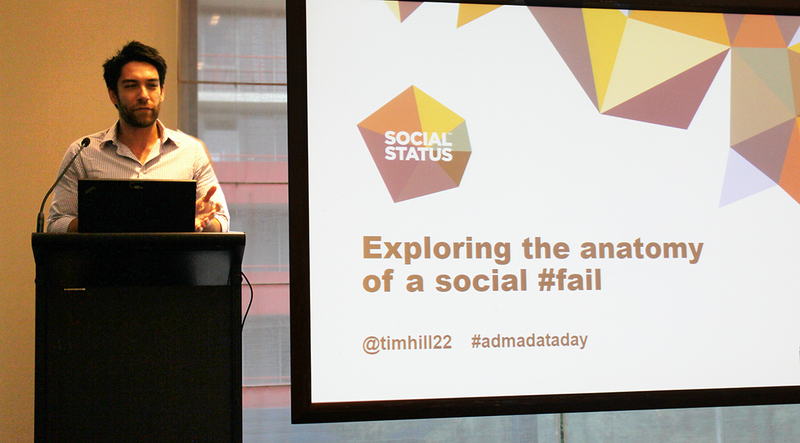 We went specifically to see Tim Hill, a Digital Strategist who co-founded socialstatus.io – a company that offers a service a bit like Google Analytics for social media. Tim Hill discussed how the possibilities for brands to communicate and connect with consumers are becoming endless with the abundance of social media in our society. After presenting three social media case studies, the main point Tim was making was that you are never really in complete control with social media. Even if you think you are, you’re not. There are too many variables in the world that affect the result of even the best social media communication strategies. The three case studies were 02, BART and Walmart. 02 is a telecommunication company, the BART is San Francisco’s train system and Walmart, we all know is the supermarket giant from America. Each company has a different voice they use on social media and Tim explained that it’s crucial to have a consistent voice with your social media campaigns, the same as you would with any advertising strategy. You can look up the case studies, but I will spoil the Walmart one for you. It highlighted ‘the troll’ element in social media and on the Internet in general. Walmart recently ran a campaign to increase their social media following, specifically on Facebook. The campaign saw each Walmart store set up a fan page. The page with the most likes would win a visit from Pitbull. A satirical columnist heard about the competition and jokingly said that everyone should click like on the Facebook page for Kodiak, Alaska. I lost it, couldn’t control my laughter and neither could everyone else in the room. We all realised quickly where this was going. Kodiak ended up with a massive 70,000 likes at the end of the completion. There are only 6,423 people in Kodiak according to Google (2013). Did Walmart have any better options here? They did, they could pull the plug on the competition, but they were smart. They realised the exposure they already received through the campaign and Pitbull was great getting a lot of Likes, so they also asked the ‘troll’ who started it all, to come with Pitbull to Kodiak as well. The point here being, that you can come up with strategies and attempt to control and steer an organic campaign, however you are never in complete control of social media. It was a great experience, we learned so much about how social strategies are formed and managed. As we leave, I grab a glass of water and standing next to me is the (now awake) sleeping man. I asked him how his nap was. He replied “after a long flight I needed it, are you staying for my talk?” Turns out he was one of the main speakers and wasn’t just a punter from the Casino who got lost on his way to his room.